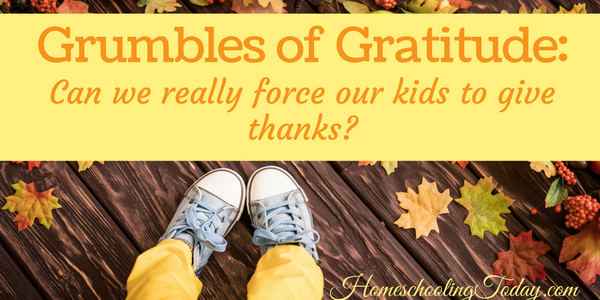 Homeschooling Today magazine | Grumbles of Gratitude: Can we really force our kids to give thanks? Grumbles of Gratitude: Can we really force our kids to give thanks? The season of Thanksgiving celebrations is fast upon us, which means in addition to an increase in foods containing pumpkin and cranberries, there is an ever-growing consciousness in being thankful. While this is certainly a worthwhile focus, it can often seem like we are just desperately trying to cram a good dose of gratitude down our children’s throats before we start letting them circle the bazillion things they want in the toy catalogs in preparation for the next holiday. Certainly our motives in wanting our kids to recognize their many blessings aren’t completely flawed, but we might be going about it the wrong way. Sometimes we want our kids to realize how hard the Pilgrims had it, and push them to give thanks for food on the table, warm houses and good health. We might cause the focus to be on how the Native Americans shared their knowledge with the early settlers, and encourage our kids to give thanks for the many things they get to learn in school each day (we can dream!). And of course, when we take turns going around the table verbalizing things we are grateful for, we really, really want our kids to say our name and how they are supremely thankful for all their sweet mother does for them. Webster defines gratitude as: The quality of being thankful; a readiness to show appreciation for and to return kindness. That’s what we really want isn’t it? For our children to be ready and eager to show appreciation for the many blessings God gives each day, and then to desire to act in such a way as to bless others as well? I would propose that the very targeted focus of being grateful on one BIG day a year is not nearly as effective as striving to cultivate a lifestyle of gratefulness all year long. This starts with us as the parents. Do we tell our kids we are thankful for them each day? For the opportunity to be home with them and the responsibility of shaping their young lives? Do we express gratefulness each time the car starts, the sun is shining or we get to go out for ice cream as a family? Do our kids hear us thank our husbands for working hard or when they unclog a toilet stuffed with 5 pairs of ballet tights? Can we see the thousand reasons to be thankful each moment, or is the desire to see gratitude expressed externally in our children something we are circling in our Christmas wish list catalogs and hoping magically materializes some day? Psalm 100, Colossians 3:12-17, and Luke 17:11-19 are all great passages in the Bible to read and re-read in your Quiet Time each day, as well as out-loud with your kids to start planting seeds of thankfulness which will hopefully take root and produce a mature harvest (no mom-prompting needed). Crystal Clark likes warm hugs, every shade of purple and seeks to love her family well as she and her husband raise their 2 hilarious children in a small Midwest town known for growing rhubarb. She is passionate about encouraging all women to rest and rejoice in Christ right where they are, and would love to connect with you on her blog at www.UnchangingGrace.com.